Fast answer: use IFNULL() in your select statement. If expr1 is not NULL, IFNULL() returns expr1, else it returns expr2. So when inches is null, a value of 1000 is used. I picked ‘1000’ because I’m sure no product will be 1000 inches long (feet would surely be used at that point). The result is the product which have inches filled will be put at the top of the list, ordered correctly, followed by the products where inches were blank (and are now 1000 inches). … or, ‘the sender that cried emergency’. Before I get into this article I’d first like to point out that this solution was not born out of anger, hostility, or any other negative vibe. It’s simply a usability and project management issue. We probably all have a sender or two that abuse the Priority setting of email messages. Perhaps they honestly think many of their message are actually very important. And that’s fine, priority can be objective. But it does cause a problem when checking email. Just like The Boy Who Cried Wolf, a sender that sets too many messages to High Priority runs the risk of being ignored. That certainly is not good for the sender. 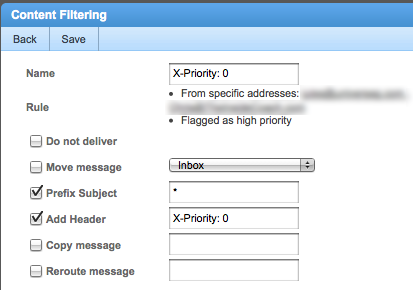 When other senders don’t use the priority setting, those messages get deferred. Not necessarily a good thing either. Turning off the Priority column to cut down the noise makes legitimately important messages look normal priority. Turning off the Priority column to cut down the noise also gets rid of the ‘Flagged’ designation. So basically speaking, someone who abuses the priority setting can really muck up the works. And you can’t really them about it either. Some email programs let you change the priority of incoming mail. I use Apple’s Mail as a mail client and it does not. I checked out scripts, plugins, even a workaround of moving the message to the Drafts mbox, change the priority, then move it back to the in mbox… which is not good because then it sets you as the sender. D’oh! I also tried editing the emlx file on the hard drive but that didn’t work, I guess because I’m using IMAP. What then can we do? What we need to do is target those few senders, reset the priority of their incoming messages, and add a visual clue that it was changed. All other senders should not be affected. The fix is dependent on the mail server software. I’ll show how to do this with SmarterMail since that’s what I use. We’ll set up a Content Filter to look for high priority messages from a certain sender, and add an action to reset the message’s priority. 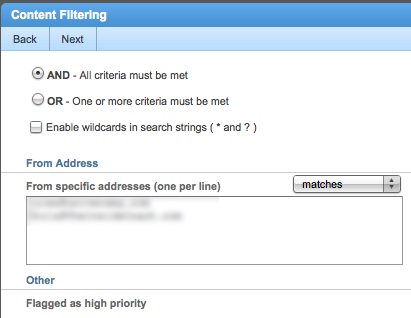 1) Click the Settings button, expand My Settings, expand Filtering, then click Content Filtering. Your list may be blank. Mine already has three set up. Just click New to get started. 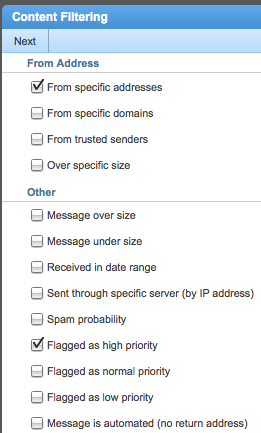 2) Turn on ‘From specific address’ and ‘Flagged as high priority’ and then click Next. 3) Make sure ‘AND’ is selected. Enter email addresses for the target senders. 4) Now finally the magic. Give this filter a Name. Turn on ‘Add Header’ and enter in whichever header name/value your email program listens to. 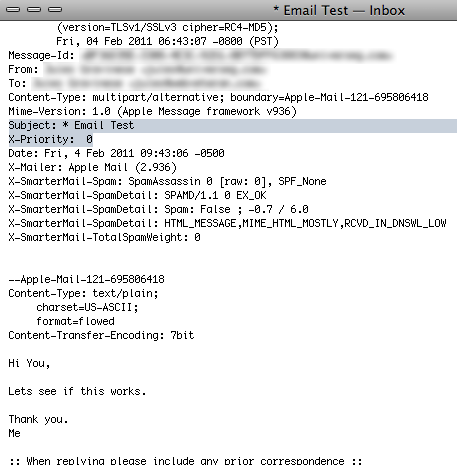 For priority, Apple Mail uses the mail header “X-Priority”. That is what I set to 0 (zero). Other mail clients use “Importance” and “X-MSMail-Priority”. Either of those you set to “Medium” instead of 0. I also prefix the subject with an asterisk. That way I still know the sender thought this message was important, without gumming up everything else. Also take a look at the raw source. You’ll see that the the original X-Priority of 1 was overwritten with a zero. WordPress is great for blogging but still has a way to go to be a CMS. One thing I find odd is that you can create Categories for Posts but not for Pages. Usually a client will want pages categorized for navigation. So this becomes a problem. Sure you can nest Pages (parents and children) but that means you must have content in every menu item. This is much faster on the front end. It also tells search engines not to index those blank categorization pages. I ran across a problem with LightView which is stated as requiring Prototype 1.6.1 and Scriptaculous 1.8.2. Yet it was failing even when I had scriptaculous 1.8.3 loaded. Apparently LightView looks for the loader scriptaculous.js rather than the actual components (effect, builder, etc). My previous compressed Prototype 1.6.1 and Scriptaculous 1.8.3 did not have the loader/stub scriptaculous.js file. Ideally, that’s never needed as long as you load the other scriptaculous js files. So here is an updated package. Also in this archive is the PHP version of the ColdFusion file to server the jgz. It includes all comments and credits. I gzipped it down to 62KB. Visually based on the “Pretty Simple” Message Style by Piotrek Marciniak, I’ve created a new breed of Adium Message Style – which boasts a completely custom scrollbar. This message style is a working proof of concept. It is a prototype for the talented folks that create wonderful message styles. I’m a developer, not an artist. I hope that others will use it as a spring board for rapid development of a whole new breed of message styles with custom scrollbars. Since Adium Message Styles are really web pages, it only seemed right to mash up Prototype JS, LivePipe UI and Scriptaculous! I’ve updated Visual Code Editor. Not so much an upgrade, but tested it out with SyntaxHighlighter Evolved 2.3.8 and WordPress 2.9.2. SyntaxHighlighter Evolved fixes a lot of the problems that VCE also fixed (for SyntaxHighlighter Plus 1.x). But VCE still comes into play when you want to use tinyMCE (the post editor) in WordPress. I tested it out with SHE and they both play very well together. Although the fixes in VCE are no longer needed, it still adds some functionality to the Visual Editor. Since nothing broke, I’m not going to fix it (remove the fixes). This allows its continued use in other client side syntax highlighters. Also, I highly recommend SyntaxHighlighter Evolved. I created a new compressed file for Prototype 1.6.1 and Scriptaculous 1.8.3. Included is my modified sound.js. It includes all comments and credits. I gzipped it down to 60KB. … which is, when moving or copying. In my application, speed increased 10x. CFSelect is nice because it can help you write out some code quicker. Just like the rest of ColdFusion. But I never used it because so many times I needed to display two columns in the <option>, such as “#lastName#, #firstName#”. I received a nice treat in the mail recently. A Happy-Winter-Solstice card from Google? Sorta. The envelope was somewhat big and said Congratulations on it. I would have tossed it if it was not from Google. 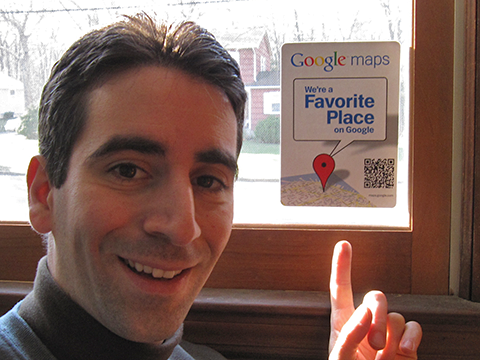 I opened it and, lo and behold, it’s a window sticker stating I’m a Favorite Place on Google. How cool! And I’ve never even heard of that. What am I Favorite Place for? Why, “web development“, of course! Apparently local businesses are supposed to put this sticker in their window. Then yuppies snap pics of the barcode with their cell toys to get instant information about the business. I donno… why not just go in and say hi? Less than 1% of businesses get these. So I’m pretty psyched. The other board members are… bored members. The list was determined based on the popularity of a business’ Local Business Center listing, as determined by how many times Google users looked for more information about a business, requested driving directions to get there, and more. Google users “decided” based on their actions, and we sent the decals. Over 100,000 businesses were identified as Favorite Places, representing less than 1% of the 28 million U.S. businesses. We believe that our standards for selecting businesses are as selective or more selective than other companies which have run similar initiatives.